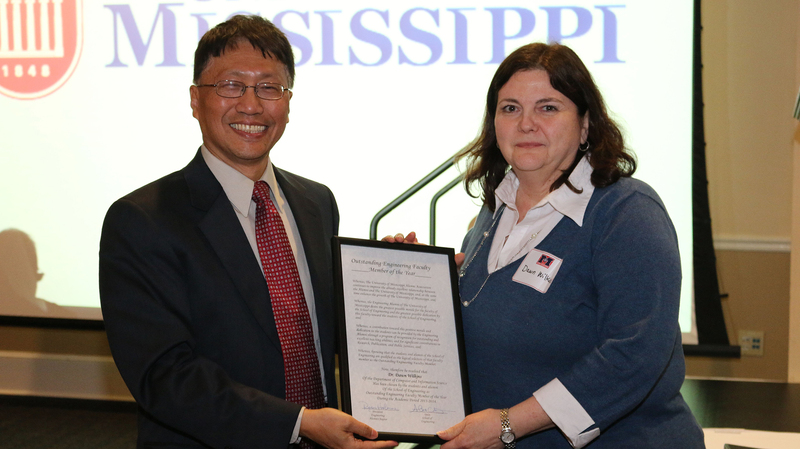 Dawn Wilkins accepts the Outstanding Faculty Member of the Year award from Dean Alex Cheng. 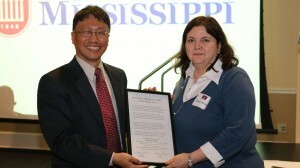 Nineteen years ago, Dawn Wilkins joined the University of Mississippi School of Engineering faculty as an assistant professor of computer and information science. Six years later she was promoted to associate professor with tenure and a few years later, Wilkins became a full professor. Throughout that period, Wilkins has been active in teaching, research and service. And at the 2014 UM Commencement, she was presented the engineering school’s Outstanding Engineering Faculty Member of the Year award. Building on her doctoral research in computational learning theory, Wilkins constructed a pragmatic research program in bioinformatics, computational biology, machine learning and related areas. She built relationships with researchers at St. Jude’s Children’s Research Hospital in Memphis, at the U.S. Army Engineering Research and Development Center in Vicksburg and at other universities across the region in departments of computer science, biology and chemistry. “Dawn drew our colleague, Yixin Chen, into the statewide National Science Foundation EPSCoR project and, together over the past five years, they have built a successful program that has supported several graduate students and resulted in many publications,” said H. Conrad Cunningham, chair and professor of computer and information science. Wilkins’ sections are among those that students rate the highest, and her elective courses are among the most popular each semester. She is sought out by many students as their project, thesis or dissertation adviser. She has been the adviser or co-adviser for four Ph.D. graduates and numerous master’s degree students. “I feel so fortunate to have had the opportunity to work with Dr. Wilkins and benefit from her tremendous talents as researcher and teacher,” said Kathy Gates, chief information officer and one of Wilkins’ former doctoral students. “In the classroom, she is known for getting students excited about learning, making them think and developing their creative problem-solving abilities. As a researcher, she applies her expertise in machine learning to develop prediction models in science domains, working as part of cross-disciplinary teams. Wilkins has served as graduate coordinator and undergraduate coordinator, and twice as acting department chair during Cunningham’s sabbaticals. She is the long-time adviser for the student Association of Computer Machinery chapter, has served on the leadership of the Faculty Senate and many other committees and organizations on campus. Wilkins has reviewed National Science Foundation proposals and is a founding member of the leadership of the Mid-South Computation Biology and Bioinformatics Society. Wilkins began college as an accounting major but quickly found that boring. Since she was taking calculus for fun, she decided to change her major to mathematics. “I had to take a computing class, using punch cards, and knew immediately that I had found what I wanted to do,” she said. A native of Springfield, Illinois, Wilkins earned her bachelor’s degree in mathematics from the University of Illinois at Springfield (formerly Sangamon State University). She taught seven years at Illinois College before earning her doctorate in computer science from Vanderbilt University. Wilkins enjoys reading, tracing her family history and caring for her pet dogs.